What’s New at DeKalb Optometric? At DeKalb Optometric, our opticians stay up to date on all the technologies and new information regarding eye care. We like to share pertinent news updates that effect our patients and colleagues. If you have any questions or concerns, we would love to hear from you today! Heidelberg Spectralis Optical Coherence Tomographer (OCT) with Blue Peak. DeKalb Optometric is proud to be the first to introduce the use of Blue Peak Spectralis OCT in our area. Spectralis OCT scanning integrates SD-OCT with confocal scanning laser ophthalmoscopy (cSLO), resulting in imaging that reveals new details through multiple perspectives of the anterior segment of the eye and the retina. These additional views are helping redefine diagnosis and treatment of many major eye diseases. 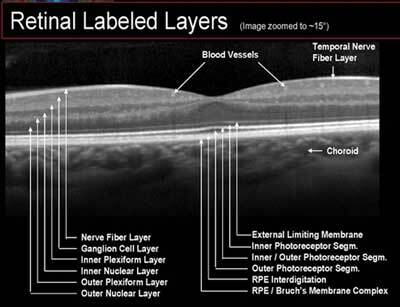 The scans of the anterior segment and retina have 20 times the resolution of a MRI. Earlier detection, and prompt, proper treatment is our goal and our promise. A paradigm shift is occurring in the way eye doctors are diagnosing and managing retinal eye problems. This new technology is fundus autofluorescence (FAF) imaging and spectral domain optical coherence tomography (SD-OCT) that allows making diagnoses easier and more precise. Due to resolutions 20 times more detailed than an MRI, the high resolution scans allow for observation of fine retinal pathologies. These enhanced microscopic views decrease the likelihood of missing signs of retinal disease and aid in early disease detection, diagnosis and management by allowing us to view abnormalities beneath the retinal surface. Combing Blue Peak with spectral domain OCT allows a non-invasive view of the health of the retinal pigment epithelium (RPE). The resulting high-contrast images form a metabolic map showing metabolic changes. It has been shown, between 55-and 70 % of Age Related Macular Degeneration (AMD) sufferers are undiagnosed, thus indicating an inadequacy in current screening and referral methods and, as such, a certain level of responsibility lies with all eye doctors to reduce the number of undiagnosed cases of AMD and other debilitating retinal diseases. Early identification is critical in most retina diseases and regular and accurate retina health checks, particularly in high-risk patients, could help minimize future damage and even prevent blindness. DeKalb Optometric is pleased to offer two new vision tests to all patients. The Diopsys® NOVA Vision Testing System provides us with painless, non-invasive vision tests that utilize electrophysiological technology, including Visual Evoked Potential (VEP) and pattern Electroretinography (ERG). VEP measures the electrical activity in the vision system. When light from an image enters your eye, it is converted into electrical energy at the retina and travels through the optic nerve to the visual cortex of the brain which processes vision. The Diopsys® NOVA-VEP test measures the strength of the signal reaching your visual cortex and how fast it gets there. The Diopsys® NOVA-VEP records the electrical response of a patient’s entire vision system and provides easy-to-read reports that give our doctors a simple way to evaluate optic nerve function. Our doctors are able to compare tests over time to track disease progression. This test does not rely on a patient’s response so the results are not affected by the ability of a patient to perform a test. This is a big advantage for the practitioner in determining the validity of the test information. VEP is useful in diagnosing and managing glaucoma as well as other neuro-vision disorders such as multiple sclerosis and traumatic-brain injury. The ERG can be used by itself for known retinal disease or in conjunction with a VEP to identify the independent components of visual loss from the retina versus the entire visual system. Early, subtle decreases in either the amplitude of the signal (strength) or latency are markers for early glaucoma, ischemic damage to the retina in vascular diseases such as diabetes, macular degeneration, etc. In summary, the ERG tells us how well the retina is functioning. Thus ERG is beneficial in making early diagnosis, objectively looking at change in functioning, and monitoring the effects of treatment.